Boxing once again received some negative attention last Saturday night when chaos ensued after the Andre Dirrell-Jose Uzcategui super middleweight bout in Maryland. Dirrell was sent down and out by a punch that landed after the bell. Uzcategui was disqualified, but Dirrell’s uncle and trainer, Leon Lawson Jr, sucker punched Uzcategui twice in the fight’s aftermath. He’s now being sought by Maryland police. 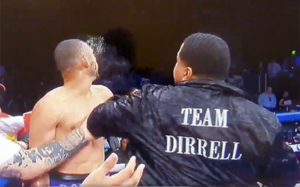 There was also an incident, however, involving Dirrell’s sibling, Anthony, for video shows the younger Dirrell brother pushing an individual in the post-fight madness. The man who was pushed is said to have been a Maryland commissioner. Needless to say, word was out that the police were quite interested in Anthony’s actions that night, as well as his uncles’. And so Anthony Dirrell looks clear to meet Callum Smith next September in California for the WBC world super middleweight title. There was word that the championship battle would be put off due to legal matters stemming from last Saturday, but both Dirrell and his representative assured me that wouldn’t be the case. “His next fight is still on,” Kusky said, a fact Dirrell himself reiterated when we spoke a short time later. “I don’t see how (the fight could be off),” he claimed. “Nobodies’ looking for me.” It’s clear, then, that Dirrell and his team feel it is safe to focus on the talented and undefeated Smith without being impeded by legal matters. Look, boxing is a rough sport. Always has been. Always will be. Nothing gets much darker than when fighters become permanently damaged or even killed. There’s other less than savory matters, however, that often abound in and around the sweet science. For years, the sport was heavily under mafia influence. What’s more, bad decisions on the part of judges still pop up on a regular basis. Worse yet, modern fans are forever being taken for saps (Mayweather-McGregor is – or will be – in a sense, only the most recent example). And then, of course, there’s the miscellaneous, off the wall stuff. Like the time an in-ring riot erupted immediately after a Riddick Bowe-Andrew Golota heavyweight throwdown. This past Saturday presented just such a scenario, when Jose Uzcategui was disqualified for hitting Andre Dirrell after the bell, an act which subsequently sent Dirrell to the mat. In response to said offense, Dirrell’s trainer and uncle, Leon Lawson Jr, absolutely cold cocked an unsuspecting Uzcategui twice. To make matters all the more insane, the entire incident was recorded for the entire world to see. Police are now looking for Lawson, who will be charged with some pretty serious stuff after such a violent assault. The trainer, who slipped out of the MGM Grand National Arena after the attack, is still essentially on the lam, as a Sunday phone call to the Saint George’s County Police Department presented no further developments. Again, boxing is a rough sport. What’s more, physical violence, which is what boxing deals in, can lead to exceedingly high emotions. Still, one simply does not get to step up to an unsuspecting person and repeatedly punch that person in the face. It’s illegal and it’s also wrong. Will Lawson be banned from boxing, as some are suggesting? Will he end up doing jail time? Maybe. Maybe not. This is boxing, after all, where nothing can be taken for granted, either in or out of the ring. Yet the dark cloud that hung over the sport on Saturday didn’t begin and end with Lawson. Up in Madison Square Garden, Terence Crawford absolutely beat the hell out of an overmatched Felix Diaz later that same evening. Fair enough, you might say, Diaz knew what he was getting himself into. And while that’s true, this author still found Crawford’s behavior unsavory. Mocking an opponent is part of the psychological warfare of boxing. Mocking an opponent while in the act of deforming that opponent’s face, however, is sadistic and unacceptable. Oh, it’s legally permissible. But it is – or should be – socially unacceptable, nonetheless. Boxing’s been having a great year. Here’s hoping the terrible moments keep to a minimum.